Arriving in Bajawa late at night, we’d had to wait until morning to realize the scale of Inierie - the volcanic peak that makes its presence felt across central Flores. Sami, a Finnish motor mechanic I’d met at the border of TImor Leste / Indonesia - and I weren't really sure of our plans. But waking early that morning in Bajawa to bright blue skies, we reckoned that we’d head towards the mountain’s base. Perhaps we'd explore the nearby villages - or hike it's gentle first few hundred meters. We weren't sure. But our unbelievable stretch of blue skies, and the cool, crisp mountain air created an atmosphere of enthusiasm. As we hired our motorbikes ($7/day), we bumped into Kamil - a tattooed Polish chef based in Cardiff - who we’d met on the bus from Ende. He was a mountain guy: disinterested in Indonesia’s vast array of coastal scenery, Kamil was here for the volcanoes. Kelimutu - the volcano-for-beginners in eastern Flores - didn't satiate his thirst for adventure, so he was heading to Inierie -and was hell-bent on making it to the top. Sami and I followed Kamil south out of Bajawa, on beautiful roads that snaked through charming villages and a deep valley shadowed by the 2225 meter Inierie. Our search for a track - any track to the mountain - took us down a series of dirt roads of the main track through the valley. Asking locals for directions didn't help - so Kamil propositioned a geriatric farmer - the sort of character who must have been ploughing these fields since before Suharto - to jump on his bike and guide us. Soon, the farmer frantically gestured for us to stop. There was a tiny entrance to a path that was barely visible through the shrubbery. But our elderly guide was insistent. Kamil handed him a packet of cigarettes as thanks, we parked our bikes, and set off through this tiny path towards Inierie. Not entirely sure we were in the right place, we stumbled through the thick shrubs for fifteen minutes, following the barely visible trail until our surroundings opened. Once above the tree line, the scale of the climb became apparent. Inierie is 2225 meters, and our trek had begun at just 1000. It's pitch looked dangerously steep in parts, and clouds hovered stubbornly around its summit. Sami and I, initially disinterested in actually making the top, were buoyed by Kamil’s enthusiasm. The day was still young, the sun was out. So we laboured onwards - following Kamil as he sprung his wiry traveller's frame effortlessly up the steep hillside. For the first third of Inierie, there is a somewhat traceable path. It zig-zags up the open, green face of the peak. The views quite immediately become awe-inspiring: looking back towards Bajawa, those picturesque mountain roads we rode in on we're clear. To the south, the Savu Sea shimmered. After two hours, our relative good spirits took a hit. The green, discernible path ceded to a messy, dramatic incline of incredibly loose volcanic rock. We inched our way up, our pace slowing significantly. There are parts on that incline where a false step might not kill you, but would certainly send you tumbling to the next rock or shrub you could arrest your fall on. It would be incredibly painful. And a broken leg would render the descent almost impossible. The final path to the summit. On the right is the crater, on the left, a steep slope running to the valleys below. Sami sits at the summit. As we made it to the cloud line, our decision to climb this barren volcano alone and unguided seemed a foolish one. But after we passed through the clouds, the crater soon emerged. We weren't at the summit - but almost. Kamil, seeing the final path to the top, decided not to go on: it was too slippery, he thought. He wasn't going to risk it. Sami and I, though, trekked onwards, treating each step with incredible care. It took us the best part of 40 minutes to inch our way up those final 100 vertical meters. We were greeted at the summit by perfect blue skies and views I've never really experienced. 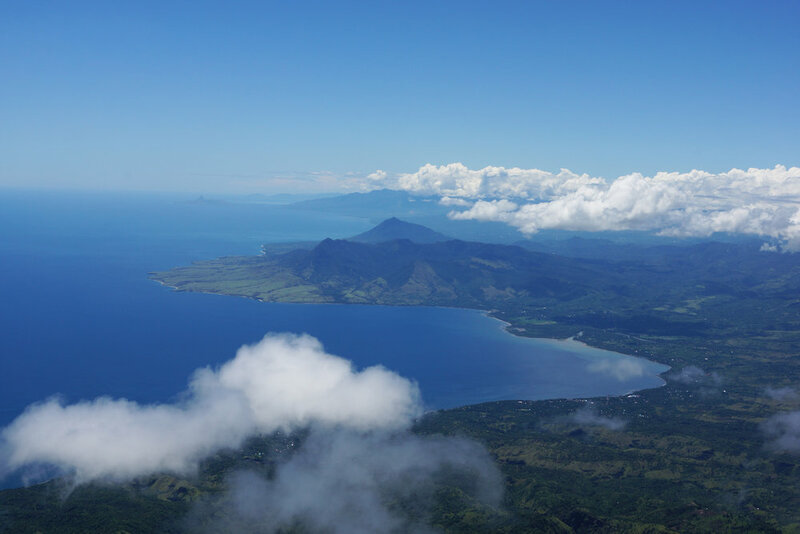 I could see what felt like all of Flores: other volcanoes dotted the horizon, the clouds below our feet scattered shadows across the vast, dark-green jungles below. The tranquil oceans were a deep blue; Flores’ endless beaches visible in every direction. And the best part? The summit was barely visited: there was no infrastructure there (or on the entire climb). There was no book to sign our names, no rails, no trash. This was a peak that felt like it was ours. We were alone on that mountain. We had one of Indonesia’s most spectacular view all to ourselves. The view from the summit: it was ours alone.